Think pink in October in recognition of Breast Cancer Awareness Month. From compacts to hoodies, many items offered by cosmetic, fashion and even auto companies will come in pink or bear a pink ribbon, the symbol of awareness of the disease. 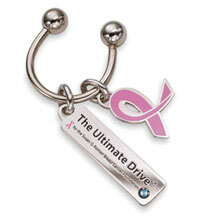 BMW's Pink Ribbon collection includes a charm key chain, $12. A percentage of sales of each item will go toward breast cancer research and the search for a cure. Among them, the Hilton Hawaiian Village Beach Resort & Spa has launched a "Travel Pink" kamaaina room package in support of the cause. The package, available through Dec. 20, starts at $183 per night and includes an amenity of a black micro-fiber tote bag with a custom-designed pink breast cancer ribbon imprint. Inside the bag is a floral pink breast cancer cloisonné pin; a "Support Breast Cancer Research" bracelet; a stainless steel bullet thermos; Mandara Spa bath salts and oatmeal soap; and discount certificates for dining and spa treatment. For reservations, call 949-4321 and ask for rate code "PIN." » Coach has introduced its Coach Gallery Breast Cancer Watch with three interchangeable bezels, at $398 ($100 to be donated to the Breast Cancer Research Foundation) in Coach stores through Dec. 31. » BMW's Pink Ribbon Collection will benefit the Susan G. Komen Breast Cancer Foundation, with sales of items ranging from a $12 charm key chain to a pink yoga towel ($30) to a Swarovski crystal-studded watch ($50). Go to www.bmw-online.com. » Sephora offers a plethora of cosmetic offerings from Philosophy's "Shower for the Cure" ($20) to Go Smile Morning Rush toothpaste ($5), respectively benefiting the Women's Cancer Research Fund and Komen Foundation. According to the American Cancer Society, breast cancer strikes more than 200,000 and kills more than 40,000 in the United States annually. Breast cancer is the most common cancer among women and the second leading cause of cancer death for women, trailing lung cancer.